With the signature scallop beaded blouson gown, Adrianna Papell offers a stunning range of dresses ideal for bridesmaid invites, red carpet events and formal nights. Sophisticated and ethereal, these dresses will accentuate the feminine beauty in you. For more inspiration and style tips, check out our ‘Bridesmaid Dresses’ style guide. 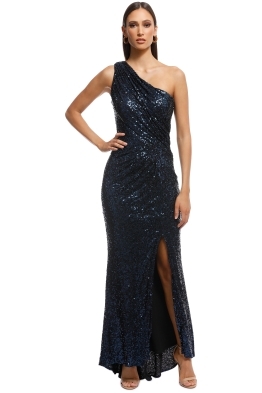 Rented this for a Gala Ball and loved it once I put it on! It was a little long for me though (I’m 165cm) and I think it was a little big for the size. But still looked great! So glad to have rented the dress - a gorgeous dress we could not find locally. excellent fit, length and quality. This was my second choice dress which I didn't wear, photo doesn't really show detail as I thought the sequins were silver, but it's a blue and gold dress and not very flattering on a full figure. Very flattering and pretty beaded detail! This dress is very flattering on and the detail in the beading is very pretty without being over the top. I got so many compliments in this dress. It’s true to size however it does cut quite high under the arm.